Print your logo onto these custom printed quad 4 x usb adapter port hubs or one of our other innovative adapters and use them in your next marketing campaign as a unique giveaway item. Quad USB Adapter Port Hubs area a lightweight and sleek in design this aluminium hub provides 4 x USB 3.0 ports and a 30 cm cable with either USB or Type-C connectors. Longer cable lengths are optional extras. 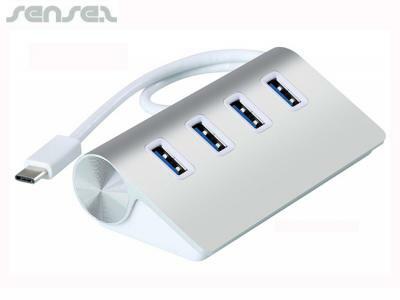 These are the perfect branded office accessory for extra usb ports for the computer or laptop. Laser Engrave: extra $1 per item. 4 x Colour Digital Print: extra $0.40c per item. Other innovative corporate gift ideas that could be suitable to create brand awareness include these cheap promotional Box USB Smart Adapters, quirky advertising gifts such as these Four USB Port Adapters or how about using one of our more bespoke custom made products such as these great quality Office 4 Port USB Hubs? Custom brand these pms colour usb travel adapter or one of our best-selling promotional adapters with your company logo! 4 colour process print is like a photographic print, where you can see a lot of detail and shading as part of your design. When we print your promotional quad 4 x usb adapter port hubs in full colour process we usually do this as a digital print. The colour match is quite good but is never quite such a perfect PMS colour match as is achieved by silkscreen print. Engraving your logo on the promotional quad 4 x usb adapter port hubs is usually done by Laser engraving, where the laser removes a thin layer of the metal surface. Your logo becomes part of the quad 4 x usb adapter port hubs and is impossible to remove. Sometimes the engraved effect will be a different metal colour to the outside metal coating of your product. We can also engrave wood or plastic. Engraving is usually a more expensive branding method. Personalize your quad 4 x usb adapter port hubs or custom design adapters for your marketing campaign. How can these unique promotional quad 4 x usb adapter port hubs or our personalized adapters fit in with your marketing strategy and help you maximize your brand exposure? Our custom made Quad 4 X USB Adapter Port Hubs can be produced from a minimum quantity of 250 pieces. We can have your logo branded on these corporate Quad 4 X USB Adapter Port Hubs. A setup fee of US$112.00 will apply to make the film.